Embedded electronics and software are more and more heavily used in modern road vehicles, increasing the complexity of development processes. In order to reduce or mitigate the risks introduced by this complexity, various automotive industry standards have been devised by regulatory bodies. These aim to enforce the use of adequate processes and hazard management methods to ensure the safety and reliability of automotive products. Consequently, compliance with these standards is key in automotive development. In addition to using suitable processes, maintaining complete traceability, and properly managing risks, another prerequisite to compliance is being able to prove all of the above at compliance audits. Finding efficient (and cost-efficient) ways to ensure and show adherence to regulations means a competitive advantage in the automotive field. IEC 61508 is the most general safety standard, often referred to as an umbrella standard, since it serves as the basis for various sector-specific standards that have been derived from it. IEC 61508 employs a risk-based approach to safety-related system design, and outlines a safety lifecycle that begins with hazard analysis. To learn more, download Intland's comprehensive brochure about IEC 61508. ISO 26262 'Road vehicles – Functional safety' is the adaptation of IEC 61508 for electric/electronic systems created specifically for the automotive industry. This is probably the most important standard in the context of automotive development, since it covers the entire lifecycle of E/E safety-related systems, defining a lifecycle from requirements through design, implementation, integration, configuration, validation and verification. ISO 26262 also provides a framework to help evaluate and classify inherent safety risks with Automotive Safety Integrity Levels (ASILs) ranging from 1-5. 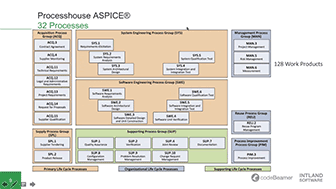 Based on ISO/IEC 15504 (also known as the SPICE maturity model), Automotive SPICE helps companies assess and evaluate their own processes, as well as those of their business partners and suppliers, and aims to make safety and reliability a priority throughout the organization. CMMI is similar to ASPICE in that it helps businesses optimize their processes, and provides a framework for determining the capability maturity of an organization (and the processes it uses). The aim of any CMMI program is to earn "appraisal", basically a certification of the maturity level (from 1-5). How to achieve and prove compliance? Due to the many requirements of these regulations, compliance is a complicated task. In general, these standards require their users to ensure transparency on requirements, use effective methods and processes during development, and maintain clear documentation on them. Since the development processes of automotive systems are complex enough even without having to deal with compliance, using manual methods to keep track of and maintain control over processes is out of the question in the automotive industry. Luckily, though, companies that aim to stay ahead of the curve can kill two birds with one stone. Using an integrated Application Lifecycle Management platform such as codeBeamer ALM not only streamlines development processes, it can also facilitate compliance. Preconfigured for automotive compliance, codeBeamer ALM allows you to tailor work items to your needs, configure and enforce your own (compliant) workflows, and document all relevant steps of the process. It automatically records links between artifacts, and maintains traceability across all phases of the development lifecycle. Using codeBeamer ALM helps document and report on processes. This can greatly reduce the effort needed to prepare for compliance audits, as well as the risk of non-compliance. Using codeBeamer, you can develop safety-related embedded systems up to ASIL D or SIL 3. 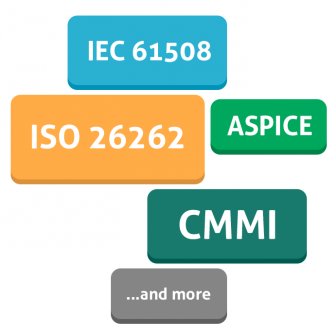 Intland's Automotive ISO 26262 Template has been created to support compliance with ISO 26262, IEC 61508, Automotive SPICE and CMMI, and offers flexible configuration options to facilitate compliance with further standards. To learn more, get in touch with us, take codeBeamer for a test drive (free for 30 days! ), or watch our webinar recording below!